However, the sidewalks along this route are also heavily used by pedestrians. In particular the stretch along Capitol Park is often full of state employees walking at lunch and breaks, and tourists, and others. This conflict could be solved by significantly widening the sidewalks, but there are a number of constraints to doing so, in particular the trees planted in the buffer strips between parking and sidewalk. So it should be resolved by separating pedestrians and bicyclists. 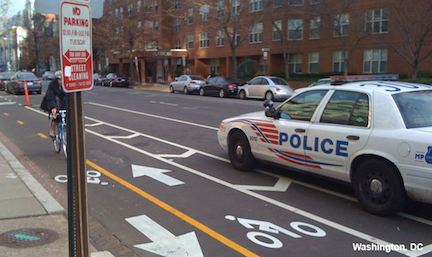 N Street would be a perfect location for the city’s first real separated bike lane (also called protected bike lane or cycle track). There are currently three lanes of traffic along this one-way street. For a brief time at afternoon commute, the street needs a large capacity, but for 23 hours a day it is mostly empty, which encourages non-congested traffic to travel much faster than the posted speed limit of 25 mph. A road diet would remove one travel lane in favor of bike space. I think that a parking protected bi-directional lane on the north side of the street would provide the greatest safety, ease of use, and least conflict with other uses including pedestrians and motor vehicles. A parking protected lane on the south side would be workable, but would cross more active streets and has the challenge of seniors needing curb-side access between 12th and 13th. Separated bike lanes are most successful where long block lengths occur, and the the block lengths alongside Capitol Park are about the longest available. There are also few driveways along the entire stretch, which is another plus for cycle tracks safety and convenience. Bicycle signal faces would be required any place that a left turn is permitted from the general purpose (car) lane, which wold be true of all the northbound one-way streets: 5th St, 8th St, and 10th St. They would be valuable at all the intersections. 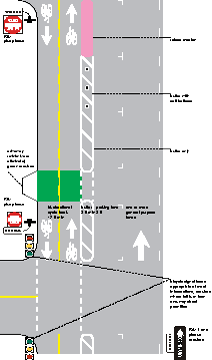 For more information on two-way cycle track designs and details, see the NACTO Guide to Urban Bikeways. Sacramento bike facilities photo album on Flickr. Previous Post Scofflaw bicyclists, or drivers?